The Howe o’ The Mearns Heritage Club starts a new series of meetings and visits on 19th September. The Club was formed in 1995 and meets monthly from September with a break in July and August. The first meeting on Wednesday 19th September will be held in the former Burgh Buildings in Johnston Street and starts at 7.30pm. The subject for the evening is the Diary of James Badenach who farmed near Fordoun in the 1790s. His notes give a comprehensive picture of the activities and challenges of the times. Mr George Anderson, the current farmer, will compare and contrast the modern equivalents. All are welcome to attend the meetings which provide both an understanding of local history and the opportunity to learn more about the area and its people. Other topics coming up this year include the story of the last Roman army to visit the Mearns, tales of the bridges in Aberdeenshire and a visit to Glensaugh Research Farm. 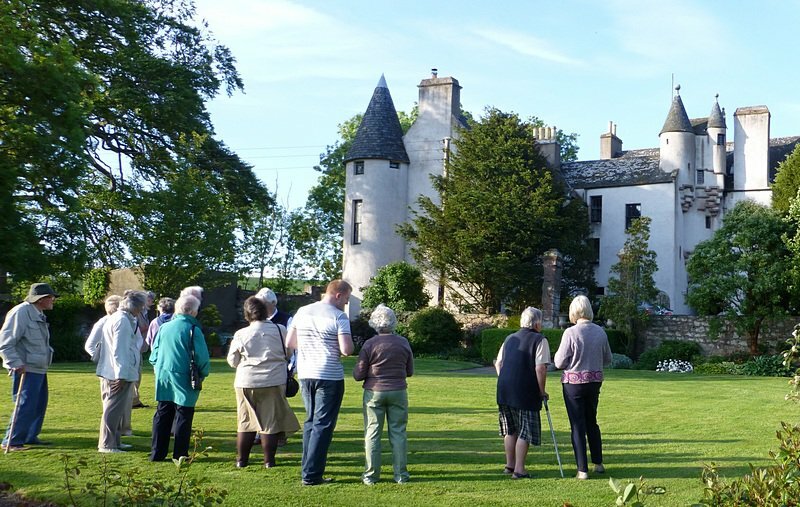 Heritage club members admiring Allardice Castle.